BACKGROUND: Optimal feeding regimens in babies weighing <1 000 g have not been established, and wide variations occur. In South Africa (SA) this situation is complicated by varied resource constraints. OBJECTIVE: To determine the preterm enteral feeding practices of paediatricians in SA. METHODS: We invited 288 paediatricians to participate in a cross-sectional web-based survey. RESULTS: We received responses from 31.2% of the paediatricians; 43.6% were from the state sector and 56.4% from the private sector. Most participants worked in medium-sized neonatal units with 6 - 10 beds. The proportions commencing feeds within the first 24 hours were 24% in infants of <25 weeks' gestational age, 36% in infants 25 - 27 weeks, and 65% in infants 28 - 31 weeks. Feed volumes were routinely advanced daily in 47% of infants <25 weeks, 68% of infants 25 - 27 weeks, and 90% of infants 28 - 31 weeks. Forty-five per cent of infants <25 weeks received continuous intragastric feeds, while 50% of those in the 28 - 31 weeks group were on 3-hourly bolus feeds. 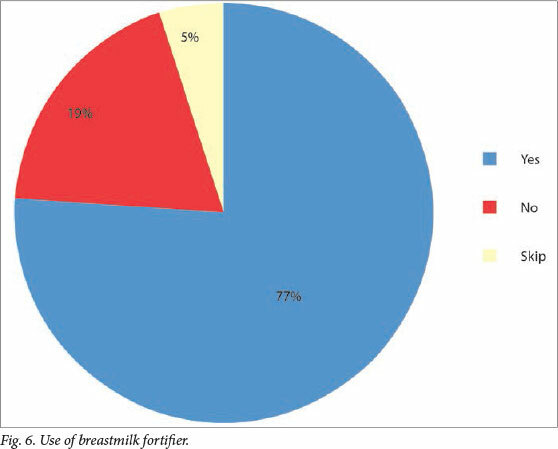 The majority of the participants targeted full enteral feeds of 161 - 180 ml/kg/d, 66.7% had access to donor milk, and 77% used breastmilk fortifier. CONCLUSION: This is the first study to survey feeding practices in SA. The survey did not highlight differences in feeding practices among paediatricians. These data could be valuable in the design of local collaborative trials to determine optimal feeding strategies. International enteral feeding practices for preterm infants have been surveyed in previous studies. Hans et al. surveyed practices in North America, Tuthill in the UK and Eire, and Patole and Muller in Australia. [6-8] Most recently, Klingenberg et al. surveyed 127 tertiary neonatal units in Australia, Canada, Denmark, Ireland, New Zealand, Norway, Sweden and the UK. These surveys highlighted a wide variation in enteral feeding practices among paediatricians. South Africa (SA) comprises a mix of developed and developing health systems, which results in wide variations of resource constraints. A wide variation exists between the private sector and the resource-constrained public sector, which potentially influences clinical care. Preterm feeding practices have not yet been surveyed in this country, and our article may inform the design of local collaborative trials to determine optimal preterm infant feeding strategies. The study was a cross-sectional survey of paediatricians working in SA state and private hospitals that had neonatal intensive care units (NICUs). The research was approved by the University of Cape Town Faculty of Health Sciences Human Research Ethics Committee. Potential participants were identiied from an online listing of 147 NICUs in hospitals across SA on the Medpages directory website. The names and contact details of 320 paediatricians working in those units were obtained by searching the websites of the respective hospitals. In addition we used an e-mail database compiled for a previous web-based survey completed in our unit. Doctors who did not treat neonates in their practice were excluded. Practitioners did not receive incentives to participate. The survey questionnaire was created and hosted using Survey Monkey, an online survey website. An e-mail containing an individualised link to the survey was sent to 288 paediatricians on 30 September 2011. The Survey Monkey collector tool collected all responses anonymously and automatically sent reminder e-mails to those who had not yet responded. Survey collection closed on 30 November 2011. With Claus Klingenberg's permission, we modiied the questionnaire he used in his international survey of enteral feeding practices. '9-The questionnaire, consisting of multiple-choice and open-ended questions, requested information about the demographics of the unit, the presence of a milk bank or access to donor breastmilk, initiation and advancement of enteral feeds, indications for and use of breastmilk fortiier, supplementation with oral vitamins, and feeding strategies after discharge. Responses were exported to a Microsoft Excel ile. Data were analysed with Stata version 11 (Stata Corporation, College Station, USA). Chi-square and Fisher's exact tests were used for comparison of categorical variables. Descriptive results were expressed as numbers and proportions (%). A p-value of <0.05 was considered signiicant. We received responses to 78 of 288 emails sent (31.2% response rate). The demographics of the individuals surveyed are shown in Table 1. Of the responses, 34 (43.6%) were received from the state sector and 44 (56.4%) from the private sector. Most of the participants (42/78, 53.8%) worked in medium-sized neonatal units with 6 - 10 beds (state sector 20/34 (58.8%), private sector 22/44 (50.0%)). Two-thirds of participants had access to donor human milk, with relatively equal distribution between the private and state sectors. 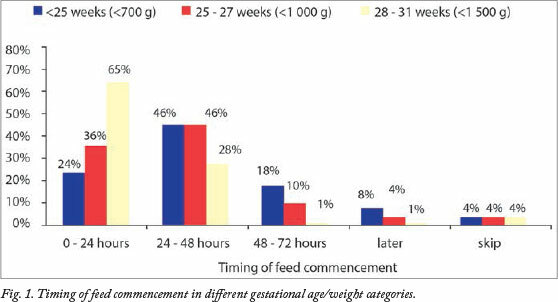 The timing of feed commencement in the different gestational age (GA)/weight categories is illustrated in Fig. 1. Most preterm infants were commenced on enteral feeds within the irst 48 hours after birth. The rate of enteral feeding in the first 24 hours was lower in the more preterm infants, whereas 65% of infants of 28 - 31 weeks' GA received feeds within 24 hours. Feed advancement strategies are illustrated in Fig. 2. Trophic feeds (minimal enteral feeds) were deined as feeding with small volumes, i.e. 0.5 - 1 ml/kg up to a maximum of 20 ml/kg/d, with this volume being maintained for 4 - 5 days before increasing feeds on a daily basis. 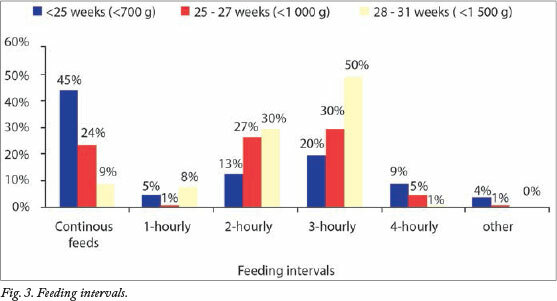 Feeding practices in infants <25 weeks (<700 g) were evenly split between receiving trophic feeds or increased daily increments. 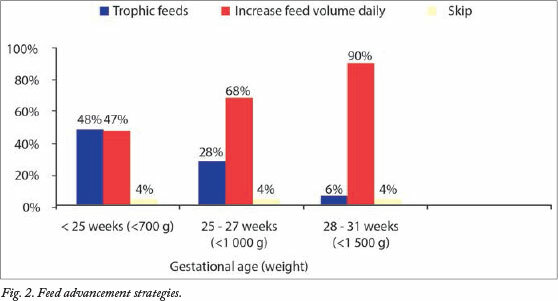 The majority of infants >25 weeks (>700 g) had their feeds increased daily rather than trophic feeds. 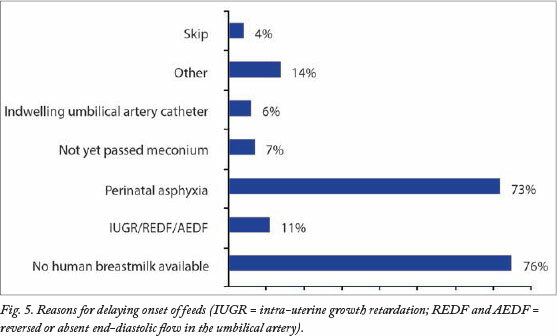 Almost half of infants <25 weeks (<700 g) received continuous infusion of milk feeds via an intragastric tube. Responses in the 25 - 27 weeks (<1 000 g) group were very similar for continuous infusion and 2-hourly and 3-hourly bolus feeds; 50% of respondents chose 3-hourly bolus feeds as the feeding interval of choice in the 28 - 31 weeks (<1 500 g) group. (Fig. 3). 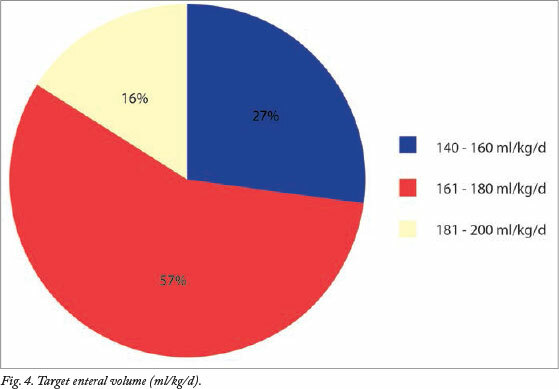 Most respondents (57%) targeted an enteral volume of 161 - 180 ml/kg (Fig. 4). The two commonest causes for delaying the initiation of feeds were unavailability of human breastmilk and perinatal asphyxia (Fig. 5). Breastmilk fortiier was routinely prescribed by more than 75% of the participants (Fig. 6). A subgroup analysis comparing all the feeding practices surveyed between public and private institutions revealed no statistically signiicant diferences. SA's ability to achieve World Health Organization Millennium Development Goal 4 of reducing under-5 mortality is proving to be doubtful. The statistics for 2008 indicate that 29% of these deaths are attributable to neonatal causes. 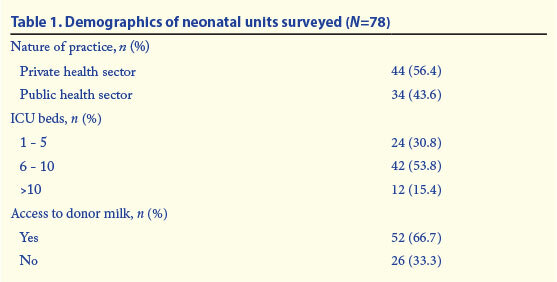 Of these deaths, 41% are due to prematurity and 23% to asphyxia, while 18% are related to infection. '12- Bradshaw et al. demonstrate a decreasing trend in under-5 mortality from 56/1 000 in 2009 to 42/1 000 in 2011. However, South Africa remains one of 64 priority countries identified by the Countdown to 2015 Initiative. Signiicant disparity exists within the SA health system. Private sector institutions are ofering First-World medicine in a developing country. In contrast, the state sector facilities that serve the greater community are resource-constrained. Improving neonatal care, in particular infant nutrition and the promotion of breastfeeding, is critically important in reducing neonatal deaths. Nutritional support in preterm infants, especially those of extremely low birth weight, is - challenging with regard to both early optimal growth and later neurodevelopmental outcomes. [14-16] Studies to date in preterm infants have demonstrated that either poor or rapid growth is associated with unfavourable outcomes, but have not yet deined what constitutes optimal growth or deined optimal feeding strategies. Previous studies have highlighted this lack of evidence, demonstrating variability in feeding strategies. Clinicians are faced with uncertainty whether to initiate feeds early or late, to use low or high volumes, and to advance feeds slowly or more rapidly. The most common reason for delayed initiation and limited advancement of enteral feeds in immature infants is concern about increasing the risk of NEC. Delayed establishment of full enteral nutrition may lead to suboptimal growth and has been associated with neurodevelopmental delay at 18 - 22 months. A recent Cochrane review concluded that delaying the onset of enteral nutrition did not reduce the incidence of NEC. Additionally, infants on slow advancement strategies require long-term nutritional support in the form of parenteral nutrition. It is encouraging to note that the participants in our survey initiated feeds within the irst 48 hours, and the unavailability of breastmilk may have played a role when feeds were not commenced in the irst 24 hours. Randomised controlled trials as well as the Cochrane meta-analysis suggest that rapid advancement of feeds in increments of between 30 - 35 ml/kg/d is safe with no increase in the risk of NEC. [1,19,21-24] Although we did not speciically ask participants what volume they used to increase feeds daily, it is worth noting that they preferred to increase feeds daily as opposed to using trophic feeds. This is encouraging, as the Cochrane review concluded that trophic feeds did not reduce the incidence of NEC or improve outcomes. Preterm infants require higher protein intakes than term infants to attain adequate growth rates, and have relatively higher rates of protein turnover. [26,27] The guidelines of the European Society of Paediatric Gastroenterology, Hepatology and Nutrition Committee (ESPGHAN) recommend enteral protein intakes of 4.0 - 4.5 g/kg/d for infants of less than 1 000 g and 3.5 - 4.0 g/kg/d for those weighing 1 000 - 1 800 g. After the first 3 - 4 weeks, the protein content of expressed breastmilk is ~1.1 - 1.3 g/100 ml. To meet protein demands, a minimum enteral volume of 180 ml/kg/d and human breastmilk fortiier are therefore needed. Of participants in our study, 20% did not routinely use breastmilk fortiier and the majority targeted an enteral volume of 161 - 180 ml/kg/d, thus in some instances not meeting protein requirement. Fortiication of human milk is associated a with short-term increase in weight gain and linear and head growth, and there is no evidence to support short-term deleterious effects. Doege et al. demonstrated that high-volume intake of fortiied mother's milk at 200 ml/kg in infants of <28 weeks' GA was well tolerated, and these infants attained weight gain comparable to intra-uterine rates. Mothers of preterm infants have difficulty initiating lactation. A Cochrane review comparing formula-fed versus donor breastmilk-fed infants found a higher rate of short-term growth but also a higher risk of developing NEC in the formula-fed group. Donor breastmilk is pivotal in early feeding strategies. Despite two-thirds of units in our study having access to donor breastmilk, a common reason for delaying onset of feeds is unavailability of breastmilk. This may be due to low donor numbers, increased demand on a limited resource, and inancial constraints on both non-governmental organisation-funded milk banks and public sector hospitals. Breastfeeding and breastmilk banks need greater promotion, utilisation and governmental support. There are a few potential limitations to the data presented in this survey. The survey asked for the policies or strategies of feeding, but did not describe the actual enteral nutrition received; the data therefore relect overall intent as opposed to speciic intakes. Literature reviewing feeding practices in the past few years, by Cochrane in particular, may have induced bias, as the participants who completed the survey had a good knowledge base. Responses may therefore relect views and opinions in the recent literature and not the actual feeding strategies employed by the individuals surveyed. The survey was also limited by the relatively low response rate. SA doctors respond poorly to mail surveys, but Internet penetration is high, which is why we decided to conduct a web-based survey. '11,33-Despite this, the response rate of 31.2% is lower than rates in the USA and Europe; however, it is higher than in a previous cross-sectional survey of paediatricians and neonatologists,[6,7,34] where less than a quarter of polled physicians responded. It is also lower than in a recently conducted hypothermia web survey completed at our unit using a similar methodology. The latter survey reported a 37% response rate, which was attributed to pre-contacting of clinicians by telephone, reminder e-mails for those who had not responded, and incentivising participants. This is the first study to survey preterm feeding practices among paediatricians in SA. The findings illustrate that similar practices are followed by paediatricians working in the state and private sectors. The need for research examining different feeding strategies to optimise early infant nutrition and ensure optimal long-term growth and development remains imperative. The findings of this study could be used to design local collaborative trials to determine optimal feeding strategies. Acknowledgements. The authors thank all the participants who provided data for this survey, and Claus Klingenberg for allowing us to use the questionnaire similar to the one used in his international survey. 1. Kennedy KA, Tyson JE. Rapid versus slow rate advancement of feedings for promoting growth and preventing necrotizing enterocolitis in parenterally fed low-birth-weight infants.